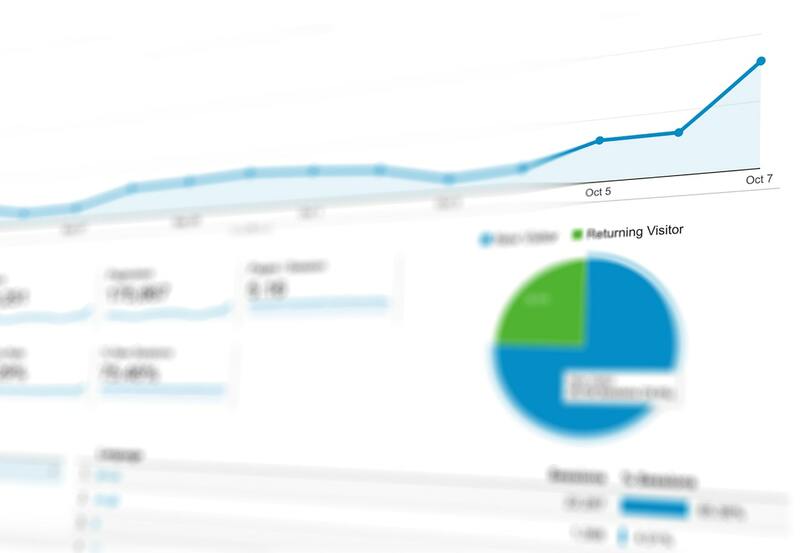 The channel performance overview in Google Analytics helps to evaluate the performance of your traffic sources on an overall level. But the default settings aren’t always as useful as they might seem to be at first glance. Within this article we will elaborate on how you can adjust the (Default) Channel Grouping to make it the way you want it to be. Evaluating the performance of each campaigns, platform, source or medium are one of the most detailed levels you can evaluate your performance data. But evaluating these all individually can be very time-consuming, especially when you have more than a hundred different campaigns running at the same time. The Channel performance overview can really help to evaluate performance on an overall level. Google Analytics has a function to group data based on their source and/or medium, automatically grouping them under a Channel. 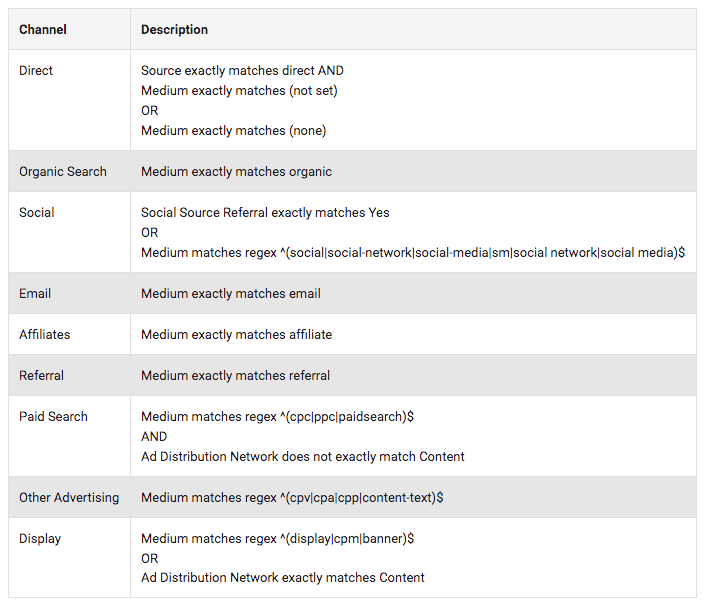 For example; all the traffic that is established by Google Ads & Bing Ads are automatically grouped under Paid Search. Making it relatively easy to monitor performance on a higher level. You example can easily see which type of traffic has generated sessions and/or conversions. Aside from that you get a high overview of the amount of interactions on-site per channel like page/session and average session duration. Where can I find the Channel Grouping overview in Google Analytics? You can view your Channel Performance underneath Acquisition and then Channels. 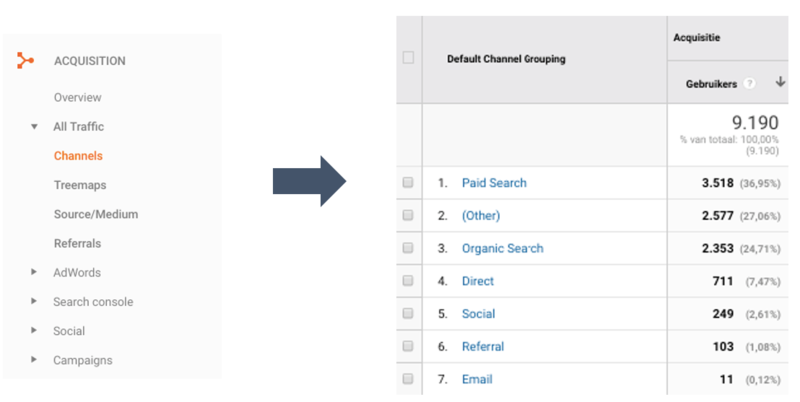 By default, you will find the Default Channel Grouping view within Google Analytics. Meaning that your channel data is established based on data of different sources with specific mediums. To give another example; when you set a campaign from an e-mail campaign in Mailchimp and you’re targeting a specific audience towards a general landing page on your website. You also have multiple click-able elements in the e-mail and you also want to measure how many sessions are created from that element in the e-mail. Never use ‘&’, ‘#’, ‘=‘, [Space] or ‘?’ inside a UTM tag value. Capital case sensitive. So a capital letter in a UTM is not the same value as a regular letter. Between Google Ads & Google Analytics, you can use auto tagging to automatically get Google Ads data coming in correctly underneath source / medium = google / cpc. The same goes for Bing Ads, resulting in an automated UTM tagging based on source / medium = bing / cpc. For most channels and/or other platforms you always need to use UTM tracking to establish a correct tracking of traffic. Now that we’ve explained why you need UTM’s to get a proper insight we can look at the Channel data that is shaped by all the traffic coming in with a specific source/medium linked towards it. 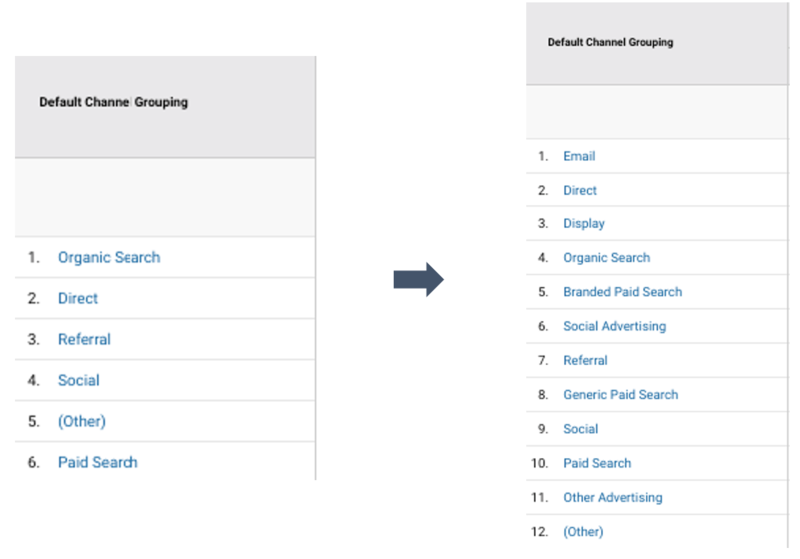 Within Google Analytics there is the Default Channel Grouping. The Default Channel Grouping will not recognise every (new/different) UTM parameter. Traffic, that is not yet “recognised”, will come in labelled as Other. With adjusting the Channel Grouping you can arrange that GA recognises the incoming traffic. As you can see from the image above; the Default Channel Grouping will not give you any insights between any organic or paid social activities that you had running. And it could be that you want a split on your prospecting and/or remarketing activities within Display. This can be done by adjusting your Default Channel Grouping or setting up a new Channel Grouping. Have a clear overview on which (GA) profile & view you use. Clear overview of the UTM tagging build-up per channel. By having a clear overview of the UTM tracking, you can determine the grouping you want to create. If you want to make a Channel Group for Paid Social. 7. Save it and check if the data is coming in correctly. It can take some time (max. 24-hours) before the traffic is showing up in the proper channel. Select to create an entirely new one or copy the existing Default and then make adjustments. We would always recommend to make a copy to prevent any errors with missing channels. Now that the data is coming in the way you want, it’s time to run those campaigns and thrive in the amount of conversions!